Phone reception can be intermittent so if no response please send an email or Whats App; we will get back to you soon. Prices are as follows. RM = Malay Ringgits over 4 to the USD and about 3 to the AUD, (March 2019). Payment by cash, bank transfer or Pay Pal accepted. Thai Baht, Euros, US and Australian dollars are OK.
150 RM , per hour, Generally a two or three hour inspection will be enough to answer most of your questions. Minimum 3 hours fee if not performed at Telaga Harbour in Langkawi. For metal boats stray current testing (electrochemical potential) is available to determine if the boat is adequately protected against corrosion. This inspection will supply you with additional information on the vessel of interest. Rather than traveling to inspect everything for sale we can narrow the field for you by an initial objective look at the boat to determine basic condition and suitability for your purpose. Written report with pictures available. Getting a (new to you) boat ready for your use can be a time consuming and frustrating process in Asia and elsewhere. We can plan your project, advise on the best solutions, acquire and install most equipment required. This service is particularly beneficial if you are away from the boat and need work done in your absence. Solar panel systems and power management (battery charging etc) comprehensive solutions available. Dozens of local cruising and offshore boats have successfully resolved their energy problems with our solar kits. It does not have to be difficult, email or call for a solution at the best price. Comprehensive inspection both in and out of the water with a sea trial where possible. Suggested sequence where boat is in the water is, in water inspection, sea trial, slip and out of water inspection. Slipping at customers expense. Naturally , if the boat is already out of the water this inspection is done first. Split inspections, (surveys done in 2 or more visits) can be performed if circumstances require. Comprehensive written report with pictures included. If Phuket is the survey location about RM 1000 additional charges for flights, accommodation and travel will be due depending on the dates. Other SE Asian and world locations on request. Multihulls & twin engined vessels plus 500 RM, if 2 visits to the boat are required (for example in water inspections first & out of water at a later date) plus Rm 200. 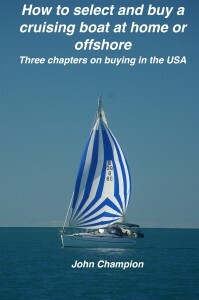 Insurance surveys if a sea trial is not required as above less 10%.